The El Paso County Water Improvement District No. 1 (the "District") is a political subdivision of the State of Texas which was established under Article XVI, Section 59 of the Texas State Constitution. 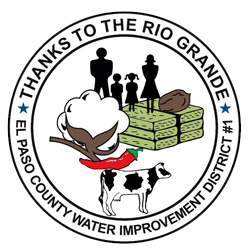 The District delivers surface water from the Rio Grande in El Paso County, Texas to water right lands in El Paso County and also assesses and collects taxes for the water right lands within its boundaries. This web site has been developed to keep water users updated with the latest news and information from the district. To learn more, click on any of the links located within these pages.